Growing up, I loved to swim. I spent every summer day at the local pool from 12-5 and 6-8. When we went to our friend’s cabin on the lake, I spent my days swimming and swimming some more. If I wasn’t swimming, I was walking along the shoreline with my dog, Toby, and the other dogs staying at the cabin. I still have a great fondness for water, but for whatever reason, I’m not a swimmer anymore. I do, however, still love walking the water’s edge and going knee-high to investigate what the water has to offer. When I brought my golden retriever, Theo, into my life, I thought he would just take to the water and swim without any issues. He did take to the water right away, but he would only go chest-high. He did not want to take that last step where his feet would not touch the ground. The same was true when Dexter came into my life. 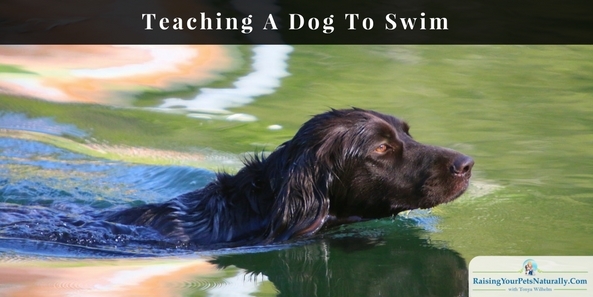 Today, I want to share with you how I taught my dogs to swim with confidence. Ideally, find a place in the water that has a gradual decline instead of a drop-off. This will allow you and your dog plenty of fun foot action, and help your dog get comfortable bouncing around in the water and having water splash around his face. 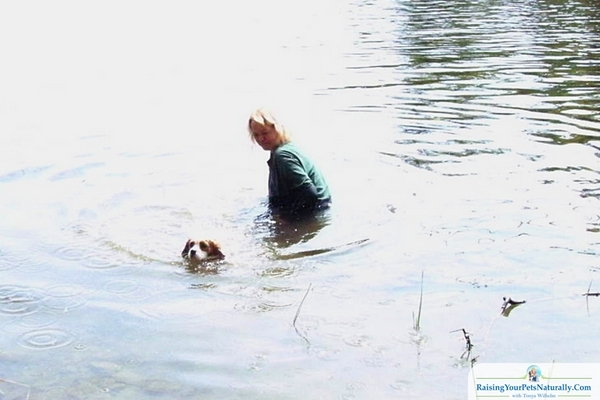 Find something your dog thinks is exciting and interesting, and do a little play in the shallows. Maybe it’s a twig that you wiggle around on top of the water, enticing him to investigate and maybe grab. If your dog is a foodie, try luring him to take a few steps in the water, then treat him. Once your dog is happy frolicking in the water, it’s time to take that first step into no man’s land. If your dog is chasing and retrieving a toy in the shallows, toss the toy about 2 feet past the point where he can touch. If he’s ready, he will go for it! Encourage him as he comes back with the toy. Repeat. 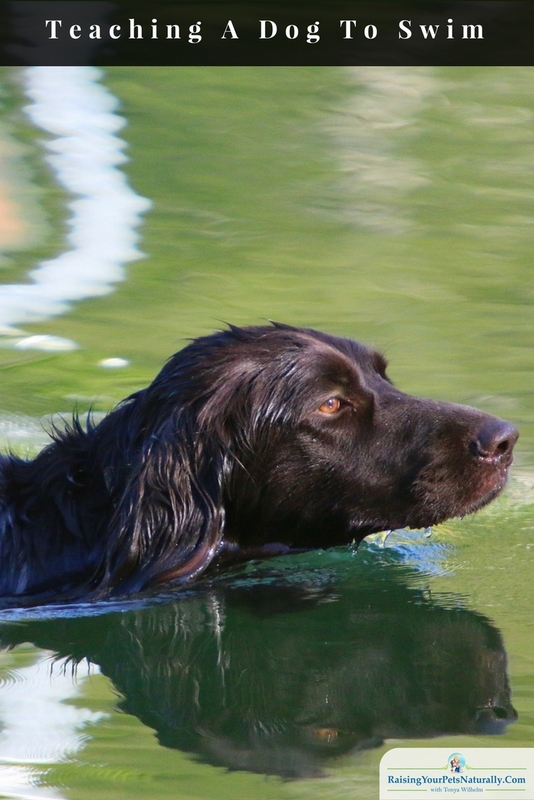 If your dog isn’t retrieving in the water, squat down with him in the water and place your hands under his belly, gently moving him toward the deeper water, just a foot or two. Keep your arms under his belly for security as he gets his water feet going and doesn’t seem panicked. As you are supporting your dog in the water, turn him toward shore and let him go alone. Again, this is only about 2 feet from the point where he is able to touch the bottom. Repeat this process as he gets comfortable. A good tip for some dogs is to use a dog life jacket. 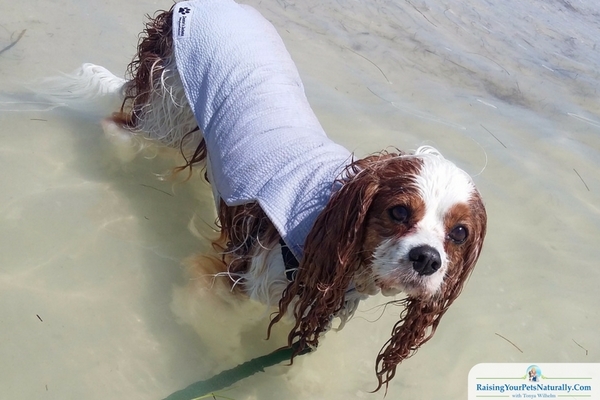 Because a life jacket proves support and the ability to float, some dogs feel much more secure wearing them while they swim, particularly in the beginning stages. Precautions and things to consider. If your dog just doesn’t seem that interested in swimming, so be it! Theo loved to swim—I had a hard time keeping him out of the water. Dexter, on the other hand, is a mucker. He likes wading in the water and walking the shoreline, but he prefers not to swim. Who’s at risk for water intoxication? We all are, if we drink too much water too quickly. Babies and smaller-breed dogs are at a higher-risk due to their size, but all breeds and all sizes can develop water intoxication. Dr. Becker explains, “Any dog can develop hyponatremia; however, the condition is most commonly seen in dogs who will stay in the lake, pond, or pool all day if you let them; pets that lap or bite at the water continuously while playing in it; and dogs that swallow water unintentionally as they dive for a ball or other toy.” If your dog is acting strangely when playing in the water, vomits, or seems lethargic or uncoordinated, seek immediate veterinary care. Remember, all dog activities and dog games need to be played with care and rest. Did you teach your dog to swim? Was he a natural swimmer, or did he just say ‘no, thanks’? Tell me in the comments. So far, Chip is not a fan of the water. One of my boxers loved to go to the lake and swim! He also liked to dive for rocks and would proudly bring them to me. We really had to watch him and limit his time in the water, or he would have stayed in all day! Just like a kid having so much fun they don’t know when to quit! Good memories!! Sure thing. With people too! Especially babies and little kids.